The most logical boundaries for an incorporated town of Massanutten are those boundaries which coincide with the service area boundaries of Massanutten Public Service Corporation (MPSC). MPSC provides private water and sewage service exclusively to the Massanutten community. The MPSC service area boundaries are controlled by the VA State Corporation Commission and currently include all areas of Massanutten Village plus the areas of Woodstone Meadows, Village Festival, and Massanutten Station — all areas as delineated in their latest approved County Master Plans. A current MPSC service boundary map was not available for this study. However, a map was obtained of the MPSC service boundaries as of 2001. The map is shown below and includes the existing boundaries as of 2001 plus the proposed boundaries which have since been approved by the VA State Corporation Commission. These service boundaries are the most logical town boundaries because they ensure that all the developed and planned areas of an incorporated town currently have or are designated to have access to all public utilities. These service boundaries have already been approved by a commission of the Commonwealth of VA and supported by Rockingham County. It seems logical to have the town boundaries retain the MPSC water and sewerage service area from the outset of incorporation. Subdividing property owners served by MPSC into groups within and outside the incorporated town limits would cause confusion. Consideration should also be given to adding growth areas to the incorporation boundaries which coincided with the MPSC service area boundaries. The basis for these additional growth areas was a recent study performed by Rockingham County which planned future growth of the McGaheysville area. 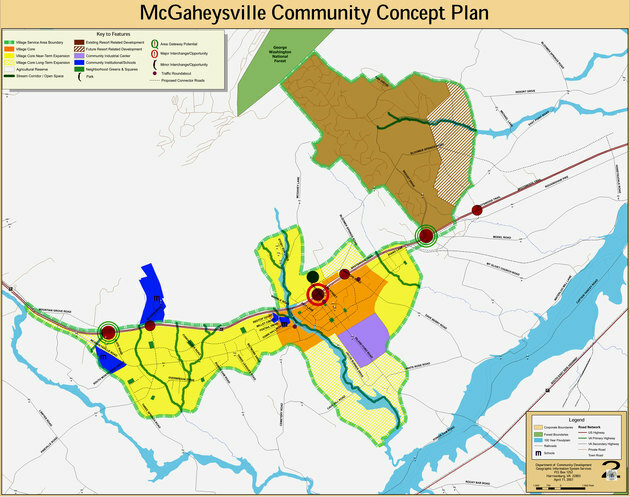 The study was concluded in 2005 and the County Supervisors approved a «McGaheysville Area Plan» in 2006 which was incorporated into its County Comprehensive Plan. The McGaheysville Area Plan includes a map which is shown below that delineates notional growth areas (designated in a brown hatched color) for the Massanutten area. Basically, the Plan allows for growth of the Woodstone Meadows and Village Festival Areas eastward toward Route 602. The Plan also designates a second entrance into the Woodstone Meadows and Village Festival Areas from Route 33 as an alternative to Resort Drive. 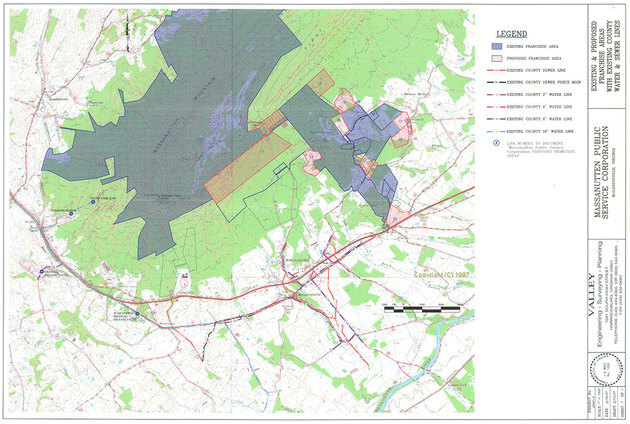 Because the Rockingham County Supervisors had approved this Plan as a part of the County Comprehensive Plan, it seemed justified to include these growth areas when determining the town incorporation boundaries, despite the fact they have not yet been designated to receive MPSC service for water and sewerage.